More info:Price includes: tours, activities and meals as per itinerary. Allow US $280 for meals not included. India is a country that is very different to anything you will have experienced before. Although this means it is not the easiest place to travel, this is also what makes it so special. Pollution, poverty and the crowds can result in initial culture shock but should be seen as an exciting new challenge. During our time here we have come to love this large and wonderfully different country but we know that we should always expect to encounter some difficulties along the way. Supporting local businesses: There are a multitude of opportunities to support local businesses on this trip. From the colourful markets to the bustling food stalls and cafes amid craft bazaars, the choices for eating and handicrafts are endless and the money is staying in the local economy - a vital way for tourism to make a positive impact. Activities that take you to markets, locally-owned restaurants, and villages are vital to the local peoples’ ability to truly benefit from tourism. Our style of trip, traveling and eating with the locals, puts you right at the heart of Indian culture. Vegetarian? You’ve found the right place, India is a haven for vegetarian food, and a delicious way to tread lightly on the planet. This trip also allows you to further immerse yourself in the culture and give back through optional activities such as joining a local guide for a trip to the outlying Bishnoi tribal villages to experience village life firsthand. Make sure to try a Makhaniya Lassi before you leave Jodhpur—a delicious local treat. Support World Heritage: On this trip there are numerous opportunities to visit important heritage sites such as the “Pink City,” Varanasi, the Taj Majal, among others. Celebrating world heritage is an important way to participate in sustainable tourism. World heritage sites are designated for protection so that all the world’s people can share in these fascinating and historical wonders for generations to come. New Delhi Streetkids Project: With more than 18 million kids on the street, it is believed that India has the highest concentration of street children in the world. It is estimated that 400,000 of these children live and work on the streets in Delhi either because their parents are too poor to provide for them, they are orphans, or they have run away from home often to escape abuse. The program we support through the Salaam Baalak Trust helps over 5,000 street children by providing them with clothes, food, health care, education, counseling, recreational activities, job skills training and job placements. Low Impact Transportation: India has lots of options for getting around making less of an impact. We always try to use transport that creates fewer emissions. We will ride the train, metro, local bus, jeep, cycle-rickshaw, auto-rickshaw, and take planes and charter buses when needed. 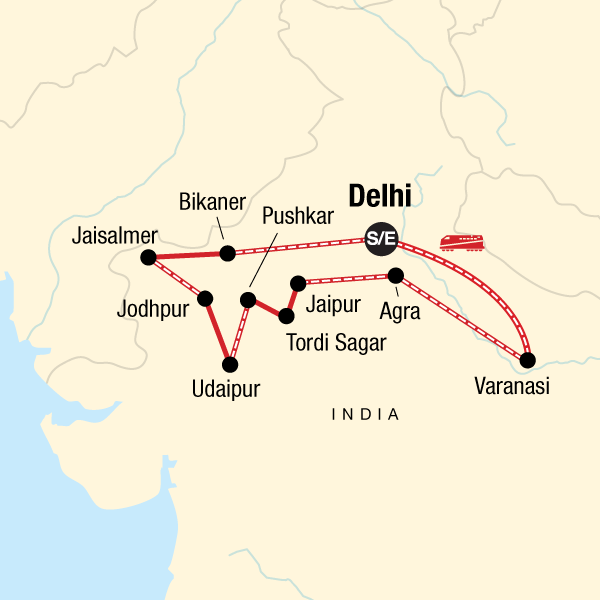 The train can certainly be counted as one of the marvels of modern India, and no visit is complete without at least one train trip. Travel by the new metro or auto rickshaws is the best way to get around Delhi. In Agra, to visit the Taj Majal and get around to other famous sites, riding one of the ubiquitous cycle-rickshaws is another experience in itself, not to mention taking local buses – always an adventure. Getting around as the locals do not only allows you to experience the culture on a deeper level, but the same way it is at home, using public transport is the most sustainable way to go – after walking and cycling of course! This company has operated on responsible tourism values since its inception. From an environmental perspective, our initiatives extend from our company offices to our tours. Our head office and stores are powered by a local green energy provider, we encourage cleaner transportation methods for staff, and purchase all supplies from a local green business supplier. Our office is as paperless as possible and our brochures use 100% PEFC certified sustainable paper. We offset emissions from all corporate flights and our marine vessel, and encourage our travelers to do so by providing an online platform through Sustainable Travel International. Supporting communties is and always has been at the heart of our tours. We provide business opportunities to local people by employing local guides and tour operators. The majority of accommodation used on our tours are small-scale, locally-owned hotels. Our tours mainly use public transportation wherever possible and are small in size to keep our impact on fragile sites and communities as minimal as possible. We monitor the sustainability of our tours through traveler evaluations in order to allow for continuous improvement. We support the local economy and business initiatives by visiting locally-owned shops, restaurants, and markets on our tours. Many tours incorporate community projects as a way of supplementing community income and supporting community development projects. In 2003 we founded a non-profit organization as a way for our travelers and our company to give back to the people and places we visit. We develop community projects around the world in the areas of health, education, small business development and environmental conservation. Funds are raised through traveler donations and fundraising. The company pays all administration fees which means that 100% of each individual donation goes directly to the community projects. Each year, we continue to support and develop new partnerships with more community projects and community-based tourism initiatives worldwide, in Latin America, Asia and Africa. On most tours, including this one, you have the option to visit a project as part of your trip. Tour leaders provide travelers with information about local environmental issues in their respective regions, and provide suggestions of how we can best protect the local environment and culture. To reduce the amount of waste created on tours, tour leaders also encourage travelers to use refillable water bottles instead of disposable plastic, cotton tote bags, reusable batteries, etc. We also include destination-specific information in our guidebooks, which are provided to each traveler including information particular to the local culture and environment and tips on how to be a responsible traveler.